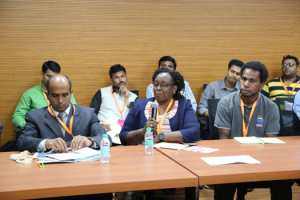 In October 2018, Internet Society (ISOC) and Digital Empowerment Foundation (DEF) concluded the 2nd edition of the Community Network Xchange (CNX) 2018 event in New Delhi, India. ISIF Asia honoured to be one of the sponsors, CNX 2018 events focused on ‘Synergies Between Community Networks and Community Radios in Promoting Public Wi-Fi Access in Asia Pacific Countries’ and welcomed representation from nine countries in Asia Pacific, and more than 30 community network providers, community radio stations and practitioners across India, Bangladesh, Nepal, Myanmar, Thailand, Malaysia, Argentina, and South Africa. The representative Ronel Vincent from ISIF Asia 2018 Award winner, University of the Philippines, attended CNX 2018. “Our recognition at the 2018 Information Society Innovation Fund (ISIF) Asia Award for Community Networks inspired us to continue our work in this space and to collaborate to other community networks all over the world,” said Ronel Vincent. “Representing the team and the Philippines, CNX 2018 was a great venue to share best practices, ideas and possible issues regarding community networks. The possibility to connect rural sites to community radios was also discussed in the exchange,” he added. Community Networks are communications infrastructure that are built, managed and used by local communities to provide a sustainable solution to address the connectivity gaps in remote areas. So far, DEF has established community networks at more than 140 locations across 15 regions, including Baran in Rajasthan, Guna in Madhya Pradesh, Nuh in Haryana, Asoor in Tamil Nadu, Barabanki in Uttar Pradesh and Nagaon in Assam. The Community Network Exchange event launched as a platform to promote the creation and growth of Community Networks, increase collaboration between community network operators in the region, and to provide an opportunity for them to engage with other stakeholders such as content producers, regulators and policymakers. CNX 2018 also followed by Digital Citizen Summit (DCS) 2018, and an immersive training on Community Wireless Networks in Guna, as part of Community Network Champions (CNC) program. CNC is a certificate programme for community network providers across the globe to gain hands-on experience in the operation and management of community networks. Previous Previous post: Support ISIF Asia to win one of the WSIS Prizes 2019 on International and Regional Cooperation: Vote by 10 February!